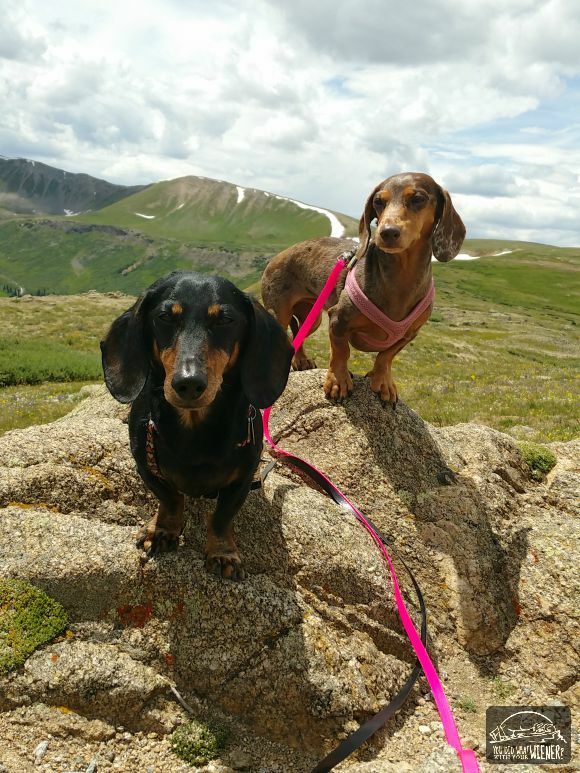 In Part II of our road trip adventure, we left you at the Mountain Goat Lodge with a beautiful sunset and two exhausted weenies (you can read Part II here). The next morning we left for Leadville to hike Mt. Sherman. 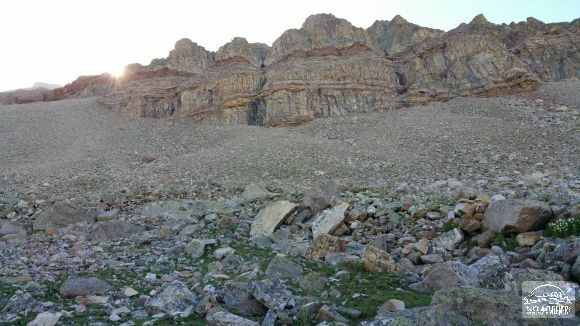 According to 14ers.com, Mt Sherman was one of the “easier” 14ers – mountains with a peak elevation of over 14,000 feet. Somewhere I got the idea that this mountain was easier than Mt. 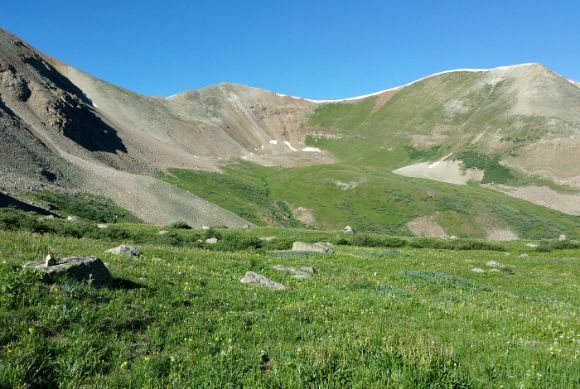 Elbert – the highest 14er in Colorado, the second highest peak in the contiguous US, the highest that allows dogs, and the one we planed to hike a few days later – so it would be good practice. My hubby is the only one of our little bunch that has hiked to the top of a 14er and that was when he was about 15 years younger. I had done some research so we weren’t totally unprepared. I knew that in high-elevation mountains the weather can change drastically in a split-second and catch you off guard; I knew that the Colorado mountains are known for afternoon lightning storms and, in fact, a group of hikers has been hit my lightning with no warning a couple of weeks before; I knew that altitude sickness can start to set in for dogs (read about altitude sickness in dogs here) and people at elevations above 8,000 feet and it was definitely something that should go on our “do not want” list. The trailhead started at an elevation around 11,000 feet and the trail started out gentle enough. We felt good as we crossed the meadow and headed for the climb. Then it got steep. The beauty was still distracting at this point but it was REALLY steep. And rocky. But we still felt good. Gretel, being the mountain goat that she is, was pulling us up the mountain as usual. The rocks and elevation didn’t seem to bother her one bit. However, our slowness did. We just wanted all of us to take it easy. Chester has spent 13 years hiking anything I threw at him but he’s a little more picky in his old age. He still does pretty good hiking, even on steep trails. However, he hates rocks. He slows to a turtles pace if there are tiny, sharp rocks, large rocks, or a lot of rocks. This trail definitely had a lot of rocks. 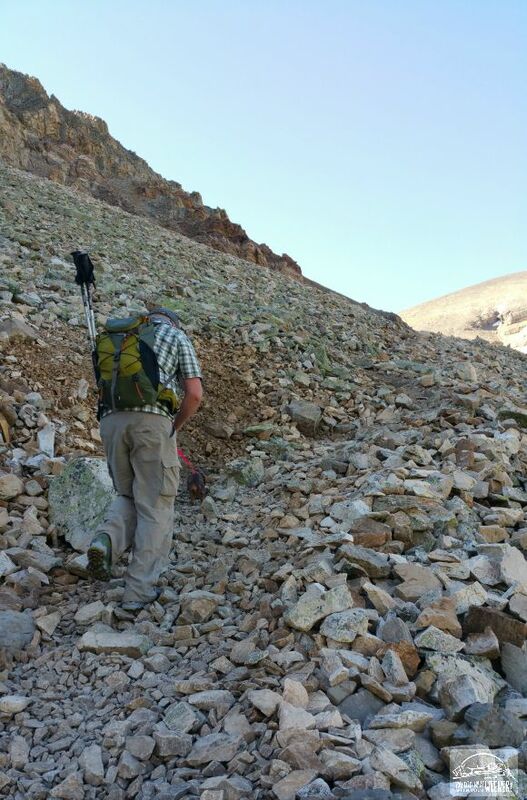 Because of the rocks, and the fact that we didn’t want to push the old man too much at high elevation, we decided to put him in our pack. This was the second time ever we had to carry Chester in a backpack. 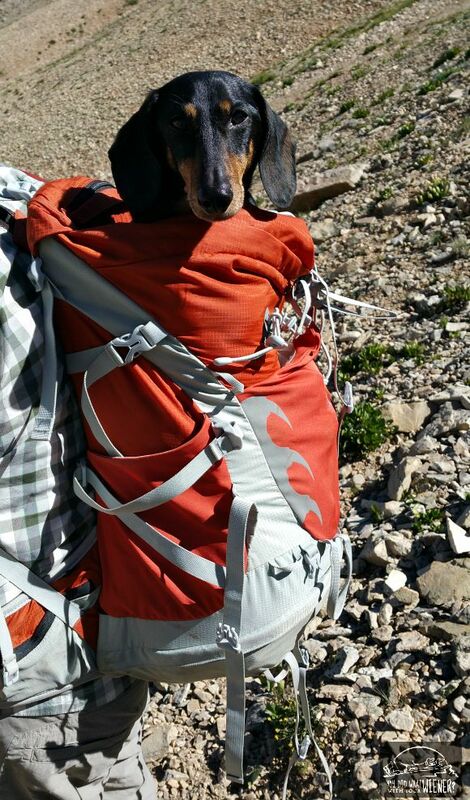 I haven’t found the ideal backpack for carrying him when we hike but my Osprey Talon 44 did the job pretty well. Did I say the trail was STEEP? Boy, was it. It was actually one of the steepest trails I have hiked. The hardest part is that it was straight up in loose rock so it was hard to get a food hold and I slipped back almost a half step for every one that I took. As we climbed higher, and my heart rate increased, I began to feel sick. My hubby took Chester in the pack to see if that would help me but I was still sick to my stomach 20 minutes later. I wanted to quit while I was ahead so we gave up for the day and headed into Leadville. I thought, if THIS was easy, what was Mt. Elbert going to be like? Luckily, I was going to have a few days to adjust to the high elevation before we would have to try. Really what sparked this whole trip was my discovery that the Leadville Hostel was dog friendly. I like staying in hostels for the adventure of it and the chance to meet other travelers but I’d never heard of one that allowed you to stay with dogs. The hostel was absolutely awesome. It was probably the cleanest I have stayed in and they seemed to have thought of everything – bug spray for guests on the porch, vending machine for midnight snacks, both private and shared, dormitory-style rooms, plus way more I can’t remember (but I remember being pleasantly surprised). Cathy, the woman who runs it, was very efficient and nice. The hostel was big enough that you could keep to yourself if you wanted but people were friendly enough that you could easily chat with someone in the common areas. There were several people staying there all summer and they were great resources for a “local’s secrets”. Honestly though, Leadville as already on our radar. It’s the home of the Leadville Race Series – both a trail run and mountain bike race world renown for their difficulty. The Leadville 100 mountain mike race is one of the most well-known on earth and it draws elite competitors from all over the world. It put the little town of Leadville, CO back on the map. Hubby and I have been into mountain biking for years and this race is like the elusive sparkly unicorn. Going to the town famous for the race has always fascinated us. It’s pretty cool too that, at over 10,000 feet above sea level, it’s the highest incorporated municipality in the United States with permanent residents. Anyway, I still wasn’t feeling well but I was starving. I thought food might help. 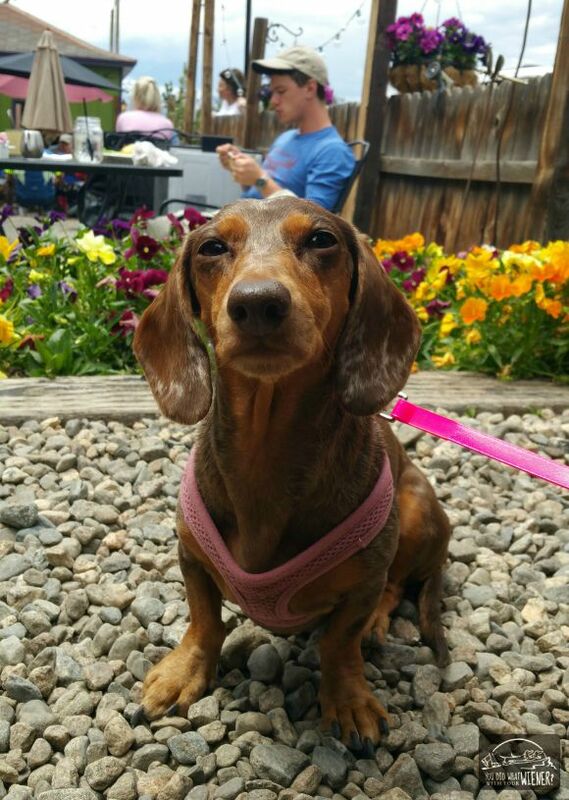 There are only two known dog-friendly restaurants in Leadville and the Tennessee Pass Cafe is one of them. As far as we were concerned , there only needed to be one restaurant. The food was good, they had water dishes for pups on the “patio”, and they had a huge selection of different foods. We pretty much ate there the whole time we were in Leadville. 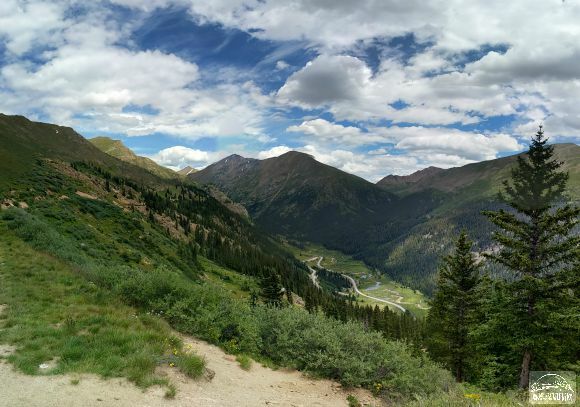 The following day I was still feeling sick to my stomach so we decided to take it easy and go for a drive to Aspen, CO.
We took the direct and scenic route over Independence Pass – elevation 12,095 feet on the Continental Divide – along the Top of the Rockies National Scenic Byway. All of western Colorado is pretty amazing and this drive certainly did not disappoint. 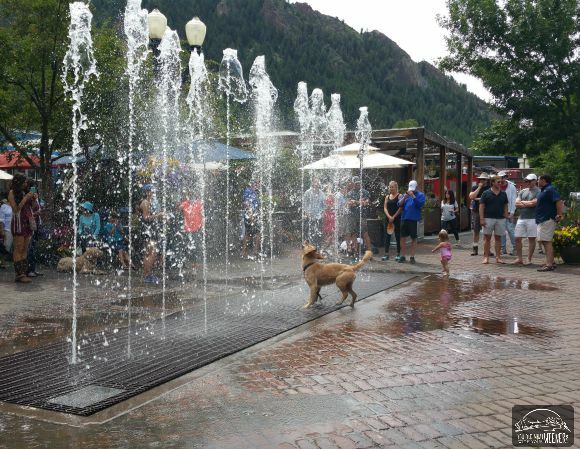 We took a little stroll around downtown Aspen and discovered this dog playing in the town fountain. I wasn’t sure if it was a purposeful act to put on a show as there were a ton of people standing around ooo-ing and ahh-ing and the owner was only making half of an attempt to get her dog to stop. It was really cute to watch though. I had researched dog friendly restaurants but we stumbled across the Ajax Tavern while we were searching for one on my list. I saw a couple of dogs on the patio and asked if we could sit there too. They were more than happy to have us. It was one of the best dining experiences we’ve had. 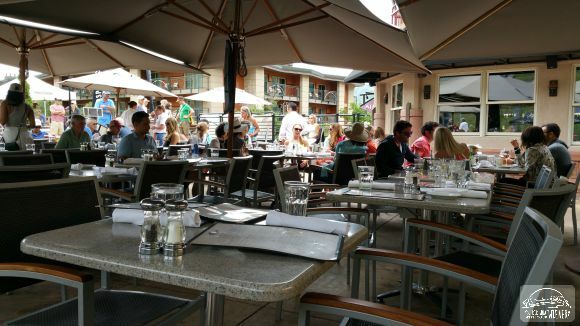 The food was pretty good, and the fact that it’s at the base of Aspen mountain was cool, but that isn’t why we were so impressed. First, the manager came out to meet and talk with Chester and Gretel when we first sat down. I am sure it helped that she was a Dachshund owner too but all of the staff were very friendly with the dogs. So we were shoving burgers and truffle fries (which were AH-MAZING) into our face when the manager came back to our table. She said the waitress felt bad for rushing us on the food – bringing us our burgers before we were done with the appetizer. She apologized profusely but we insisted it was no big deal. A few minutes later, our waitress came out. She apologized again and said they were taking the cost of the tuna tartare off of the bill… all because they brought our food too fast! We’ve never had an experience like that. Aspen is a rich town. You can’t tell who is rich and who is not by looking at people either. Millionaires can look like dirtbag ski bums and people with less than average incomes can dress in Chanel. I am not making any judgments about specific people, or even all people with money, but the truth is that some of them can be entitled and demand a uber level of service (we saw this is action with a rude guy at the bike shop – “Don’t you know who I am?!”). I am guessing that it’s wasn’t just how cute Chester and Gretel were. 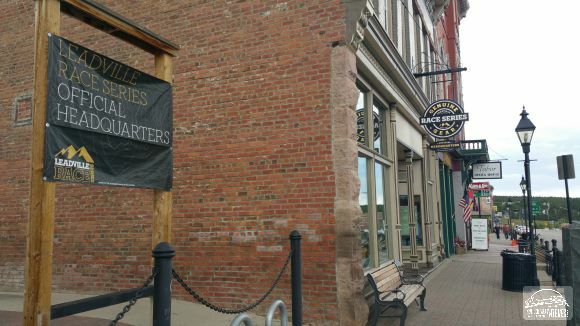 I think businesses in Aspen have learned that people expect a high level of service so that is what we got. They never know if they are talking to the next Steve Jobs. When we said we were going to Aspen, a lady at the hostel asked if we were going to see the Maroon Bells. She looked at me like I had two heads when I innocently asked, “What’s that?”. 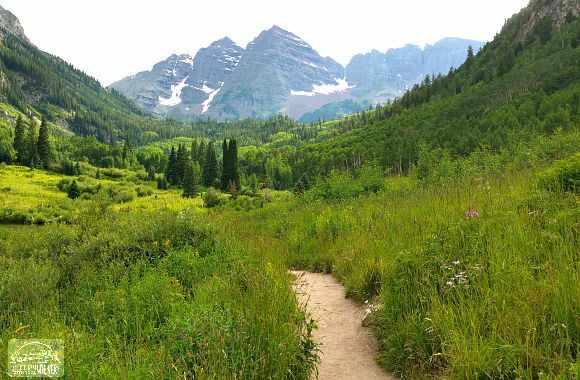 Apparently the Maroon Bells are some of the most famously photographed mountains in Colorado. When we visited, we could see why. The hike up to the first view is only a short stroll from the parking lot. We hiked a little further but we started to lose the views once we got into the trees. We saw people in the parking lot clearly leaving or coming back from an overnight backpacking trip and hubby decided we must come back someday to do that too. 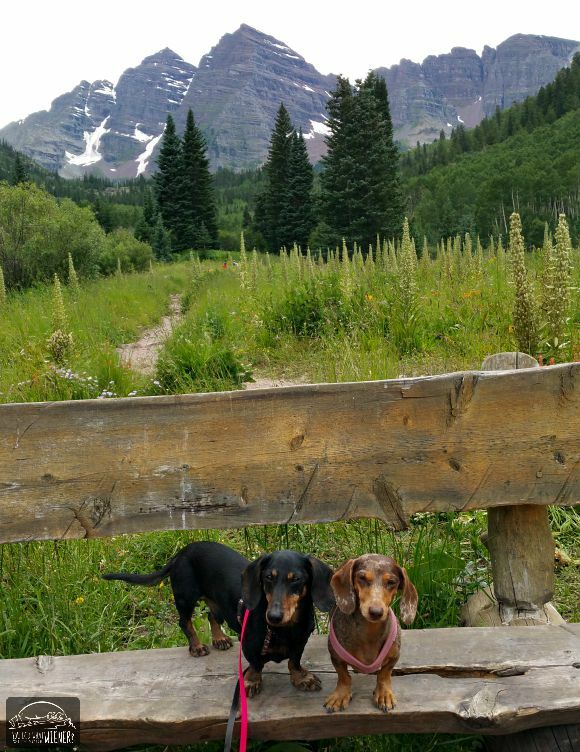 I know the trail up to this view, and a little past, is dog friendly. I am not sure the backcountry area allows dogs though. I guess I have some research to do. I’ve got the final leg of our trip still to share with you. Be on the lookout for Part IV. 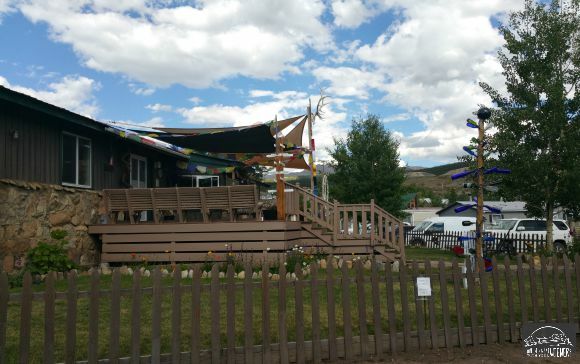 Also Check Out Part I – Seattle to Denver and Part II – Denver to Salida and the final leg of our trip in Leadville – Part IV. Lovely photos! Particularly love the one in the pack. Boy that dog with the water was having a pretty great dog day, huh!